The second full trailer for Mission: Impossible – Fallout has been released. The sixth film in the franchise, written and directed by returning Mission: Impossible – Rogue Nation director Christopher McQuarrie, finds Ethan Hunt (Tom Cruise) and the IMF team seemingly paying for a lifetime of tough choices. Hopefully, given Cruise’s age and declining box office appeal, this will be the finale or at least a transition for the franchise, which-aside from the regrettable second installment, has been one of the longest-running, best franchises in all of movies. Cruise has been playing Ethan Hunt now for 22 years…which should make all of us feel extremely old (including Cruise). Mission: Impossible – Fallout finds Ethan Hunt (Tom Cruise) and his IMF team (Alec Baldwin, Simon Pegg, Ving Rhames) along with some familiar allies (Rebecca Ferguson, Michelle Monaghan) in a race against time after a mission gone wrong. Henry Cavill, Angela Bassett, and Vanessa Kirby also join the cast. The Super Bowl has become a movie trailer showcase over the last ten years, but most are 90 second teaser spots (a montage of which we’ll have tomorrow), but the first full trailer for Mission: Impossible – Fallout has been released. The sixth film in the franchise, written and directed by returning Mission: Impossible – Rogue Nation director Christopher McQuarrie, finds Ethan Hunt (Tom Cruise) and the IMF team seemingly paying for a lifetime of tough choices. Hopefully, given Cruise’s age and declining box office appeal, this will be the finale or at least a transition for the franchise, which-aside from the regrettable second installment, has been one of the longest-running, best franchises in all of movies. MI: Fallout opens July 27, 2018. Along with the news that MI:5 is officially locked, comes the third trailer for the film. It is a little late to lock a film that releases next month (July 31st), but you also have to keep in mind that this was originally a Christmas release that was bumped up five months to get it the heck out of the way of Star Wars Episode VII. I’ve loved everything I’ve seen from Christopher McQuarrie’s fifth IMF go-round, and honestly I’m looking forward to this more than I am Terminator 5. The new flick finds Hunt’s highly effective but destructive Impossible Mission Force (IMF) disbanded by vengeful Washington bureaucrats such as the CIA chief (played by Alec Baldwin). 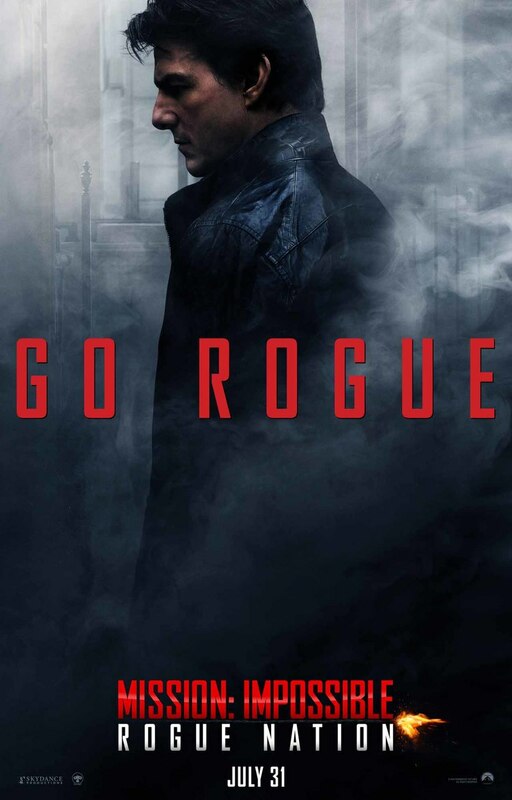 But Hunt pulls his team together (Jeremy Renner, Simon Pegg, Ving Rhames and newcomer Rebecca Ferguson) to battle the shadowy force known as “The Syndicate” and its elusive leader (Sean Harris). I love this series and this looks fantastic. I almost forgot it had moved up to the summer. Get ready for a fifth go-round with the IMF team on July 31, 2015.